New Delhi: Women in Delhi are daring to dream for themselves and their children. Many are re-crafting their destiny by making the bold and unusual career choice of a professional driver. Stories abound of women taxi drivers from disadvantaged communities who have braved dissent at home and have become main earners for their families. By transforming their circumstances they have become an inspiration for other women and are contributing to the positive social change in society. Gulf News spoke to two taxi drivers ahead of International Women's Day. Shanti, 31, suffered torture at the hands of her husband for many years. Fed up of her drunkard husband's wayward behaviour, she was forced to take up a job when her first child was just over a month old. She said: "I suffered silently for long. But had to take a stand for the sake of our daughter, as most times my husband remained jobless." From 2005, she took up jobs that came her way including working as a receptionist with a private company and later at a call centre. During 2008, Azad Foundation (AF) and Sakha Consulting Wings (SCW) headed by Meenu Vadera and Nayantara Janardhan, respectively, began a social enterprise to provide safe transport solutions for women in urban areas. The concept — ‘for women, by women' — caught the eyes of several women who, due to lack of education, did not have exposure of the world outside their homes. 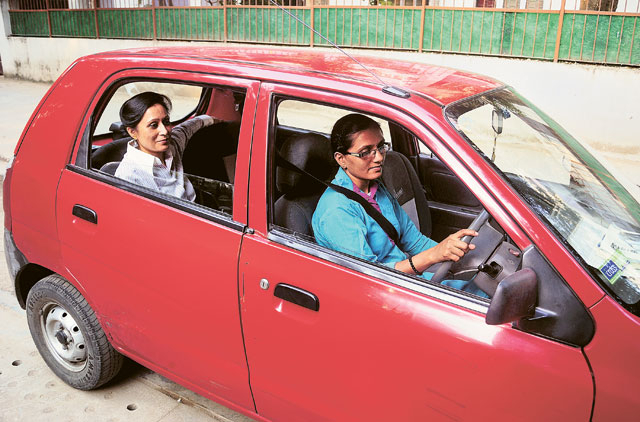 Meenu and Nayantara had systematically tapped women from the lower strata of society and were themselves surprised to see women coming out of their homes and approaching them to learn to drive. By the time Shanti walked into SCWs office in 2009, nothing had changed for her on the home front, except that now she had three daughters to look after. "Resolving to take matters in my hands for good, I decided to break the stereotypes and train myself to become a professional driver, something that until then was unheard of," Shanti said. After training for eight months, she worked for a year as private chauffeur with a businesswoman residing in south Delhi's Vasant Vihar. Drawing a salary of Rs5,500 (Dh402) per month, Shanti sent her children to school, a move that probably drew the ire of her husband more. He left the house the same year. Thereafter, Shanti graduated to becoming a commercial vehicle driver and driving Maruti's Alto, she is now able to earn around Rs8,000 to Rs9,000 monthly. Exuding power, the mother of three daughters aged, 12, 9 and 6, Shanti is immune to the looks of the passers-by and drivers alike as she navigates her way during rush-hour traffic. She has changed her life — all on her own. Do Raj Thackeray's video rallies expose Modi's lies?